“Scientists from the Jülich Supercomputing Centre have set a new world record. Together with researchers from Wuhan University and the University of Groningen, they successfully simulated a quantum computer with 46 quantum bits – or qubits – for the first time. 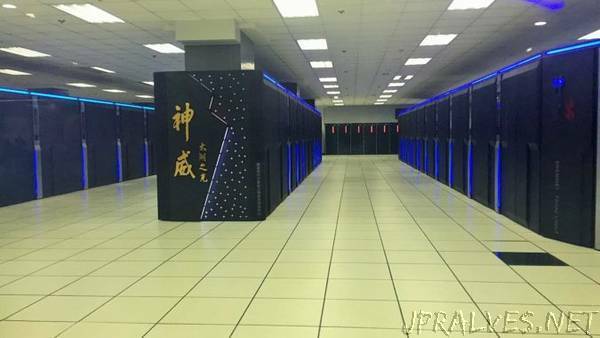 For their calculations, the scientists used the Jülich supercomputer JUQUEEN as well as the world’s fastest supercomputer Sunway TaihuLight at China’s National Supercomputing Center in Wuxi. Software developers won’t have to start from scratch when the first practically applicable quantum computers become available in future. It is today possible to simulate the functioning of relatively large quantum computers on classical digital computers. The computational effort involved, however, is enormous. The amount of memory required doubles with each simulated quantum bit, or qubit. Many codes lose efficiency if calculated in parallel on a large number of compute nodes. However, the software which Michielsen has been developing together with her partners for over ten years scales almost perfectly. It shows hardly any loss in performance even if several million compute nodes are applied at the same time, as is the case with the Chinese supercomputer Sunway TaihuLight. Michielsen has already set a number of benchmarks in the past. In 2010, she became the first person to simulate a quantum computer with 42 qubits on the former Jülich supercomputer JUGENE. She then surpassed that world record in 2012 with the simulation of a 43-qubit system on JUQUEEN, the successor to JUGENE. Most recently, Michielsen simulated a 45-qubit quantum system together with partners from universities in Groningen, Tokyo, and Wuhan, thus equalling a record set in spring 2017. For that more than 500,000 gigabytes, or 0.5 petabytes, of memory were needed. The latest breakthrough, which involved the simulation of a quantum computer with 46 qubits, was achieved following an adjustment of the simulation code. The representation of a quantum state now only requires 2 bytes instead of 16 bytes, without the accuracy of the results being significantly reduced. Other users can benefit from this simplification, which equates to a reduction in required memory by a factor of eight. The new version of the simulation software now enables a quantum computer with 32 qubits to be simulated on a notebook with 16 gigabytes of memory.